Prasiolite or Green Amethyst is one of our strong products because Green Colored Amethyst is growing in demand. Many times our customers read about Green Amethyst and ask us about the origin and natural appearance of this stone. Well when we talk in gemological language then it is called Prasiolite which is a Greek word and stands for “leek-green”. It is made by heating Amethyst just like Citrine. If you are thinking that all natural Pink/Purple Amethyst can be made into Green Amethyst, it cannot. Only deposits from Montezuma in Minas Gerais Brazil and from Arizona in the U.S. can be heated to make Green Amethyst (Prasiolite). Deposits from these mines are heated to about 500 degrees centigrade to produce this color of Amethyst Gems. Sometimes our customers ask us if the market value of Green Amethyst is lower than the Pink Amethyst then why is the material from mines heated to get this color. For the answer to this question, only the very light color Pink Amethyst is heated to produce Prasiolite or Green Quartz crystals. Other stones of Quartz family are lemon, smoky, beer, rose, citrine, amethyst African, amethyst Brazil etc. Volcanic activity of earth or earth’s core natural heating also change the color of Purple Amethyst to Green Amethyst, this process is natural heating process. As stated above that scientific term of green amethyst is ‘Prasiolite’ which is golden-green quartz stone, similar color as peridot or green gold. Major factor in green amethyst is color. Price depends on clarity and intensity of color. Intense green amethyst with good clarity is high valued. Some fake suppliers in the market are selling Synthetic Green Quartz as Green Amethyst gems made by the hydrothermal method. These can be identified by a deep color level. We are Navneet Gems, and running our own production house for all types of loose gemstones in different cuttings, sizes and shapes. We make regular to fancy gemstones in different sizes on order also. 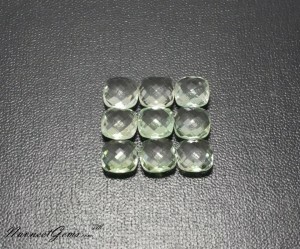 Sometimes our customers ask us for rose cut cabochons in Green Amethyst, checkerboard cabochon which we also produce and supply to them with in one week. All of our craftsmen are well experienced and it reflects in our quality. Mainly faceted stones are used rather than cabochons. We manufacture from 1mm to 20mm cut and cabochons (starting from 1.5mm) in different shapes like oval, round, marquise, cushion. We make diamond cut, regular cut, rose cut, uneven cut and all other fancy cuttings as well. When we talk about general pricing, it starts from $.50 per carat for our Green Amethyst and then it goes higher according to size, shape and color level. 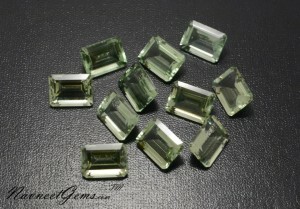 Cabochons are 20-30% cheaper than faceted stones prices. The Astrological use of Green Amethyst and Purple Amethyst are quite similar. It can be used to help to get rid of drinking addictions or a habit of anger. It helps to release all negative energies and helps you to gain positivity and also helps to open the crown and third eye chakras and enhances love and compassion. You can say it provides a solution to several problems – anger, intoxication, negativity, disease, instability in business and many other problems. It’s not just for saying because all of these things are experienced by many people. Sometimes if astrologers recommend you buy Emerald and you cannot afford it, then you can simply use this stone. It is a way of movement like a traffic signal green light. When we talk and compare Green Amethyst to other transparent to translucent stones like our Emerald, Tourmaline, Tsavorite, Chrome Diopside and Peridot then this stone is the cheapest with decent color. The availability of this material is also easy, if you in need big sizes above 10 carats in other green colored stones then the prices come very high for good material and even though, sometimes don’t have the availability. This is the reason all silver jewelry manufacturing companies are using this stone in their designs. Apart from price, quality is another big factor. Green is the favorite color of people from different countries. One of our customers, who is running a big jewelry company, sent us an inquiry for green color stone and asked for an option that is good on color, quality and also affordable, to minimize the price of his jewelry piece. We sent him many options but in the end he chose Green Amethyst for his rings, bracelets and pendant designs and now we are supplying to him regularly. If we see the lighter side of Green Amethyst then it’s pale in color than other green stones but still considering price, quality and availability, this is the best option of green gems jewelry. We are currently producing Green Amethyst/Prasiolite in all available sizes in small, medium and also in big sizes (freesize) in large quantities and exporting to many companies around the world, to be distributed or to be consumed in their Jewellery manufacturing. If you are looking for Wholesale Prasiolite or Green Amethyst, then we are the perfect supplier of Wholesale Green Amethyst, straight from the Mines, and we get our raw Prasiolite straight from the Mines of Africa and Brazil. These are pictures of just a few sizes, to show our color, which in this case shows a little lesser green, towards grey-ish, but in real life, it shows its true color. Please contact us ASAP, to start to open a wholesale account for Prasiolite/Green Amethyst with us. Our prices are competitive and quality is excellent for our hand picked, and hand crafted gems. Are you running a Silver Jewelry Manufacturing Company or reselling gems or buying for your own and are looking for a supplier who can manufacture different stones, sizes, cuttings (rose cut, normal cabochons or faceted stones) and shapes at wholesale prices and deliver to you within 1-2 weeks? Well here we are who can accomplish all of your needs and value for your time and money. If you also need a certificate then we also provide that for all stones we supply. If you need 1.5mm, 2mm, 3mm, 6mm, 8mm or any size for your own designs in Amethyst cabochons, faceted stones, rose cut with high dome to low dome then simply email us. Our online gemstones selling team will reply to you promptly with prices, pictures, quality info and other details. If you have any sample of your special cutting then you can also send it to us and we can produce any quantities in exactly your desired design. You may read more information on all of our other product pages where we have all origins, manufacturing, basic price and quality details and in case you don’t find the information that you are looking then simply drop us an email. © 1987-2014 Navneetgems all rights reserved.